Summer spells only one thing – MANGOES in capitals. The king of fruits is what mangoes are for some, even a novice can distinguish amongst the mangoes. For the connoisseur, mangoes are a byword in luxury, precisely peeled, cut to perfection, served beautifully untouched by hand. It is a fruit on which nearly everyone goes gaga on. And the capital is never left behind in its repertoire of mangoes. And why not, it gets flown in from the entire country. India may have innumerable mangoes but in Delhi it is riot from April onwards when mangoes start coming from the South initially, the the West and ofollowed by the ones from North. Mangoes actually taste better after the first showers of rain. That apart, the range is mouth watering. Each mango has its particular nuance. The earliest to make its presence is Safeda as it is pronounced. Safeda is excellent for mango shakes. Then comes the Malda, smallish and green in colour. A good variety is the red coloured attractively called Sindoori. Yes, it looks a beautiful red and yellow just like the sindoor women use!!! and tastes wonderful. Safeda, Kesar from Gujarat, Kesari, hapus, tota (because it is parrot shape like)…. Mid June onwards Dussheri makes its way, hapus, langda, chausa, dinga, saroli….Though for the discerning it is Ratnagiri Alphonso, Malgoa from the South….both which need some endurance to procure directly. It is usually advised to soak the fruit in water to remove its heat. Milk / curd and mangoes go very well together. Nearly all restaurants / five star hotels plan their particular Mango festivals and there is range from Mango puddings, custards, kulfi, Mousse, Doughnuts, Tarts…..check out and create your own “must have” lists for every summer. Not to be missed ice creams and Gola or chuskis. Gujarati restaurants serve Chhunda, Amras, Kadhi, Kalakand, Mishi Doi with mango flavours are available at Haldiram & Mother Diary outlets. Location - A natural place is the Azadpur Sabzi Mandi, the C block is reserved for it, or pick it up from the Adarsh Nagar metro station. Okhla Subzi mandi has its range. The price there is almost 1.3rd of what one pays near homes. INA market, Khan Market, also stock plenty of mangoes including the exotic ones. Exhibitions - The Delhi Government holds a two day mango festival in June – the venue which earlier was the Talkatora Indoor Stadium has since moved to Pragati Maidan, Dilli Haat – INA and Dilli Haat Pitampura. Watch out for it as the ads come out only a day or so earlier. One can taste a host of items from mangoes – jams, custards, puddings….and of course get to see the best of mangoes. Sad part though one cannot buy everything, majority is only for display. There are no sign boards or pamphlets available. All types of mangoes from the very tiny measuring a few cms to 5 inches can be seen, as well as rare exotic ones. Highlight - Mahilabadi fares come with plenty of experimentation. Mahilabad is known for its Dussheri and a host of mangoes the varieties of which can be seen at the Mango festival in Delhi. Insider Tip - The NHB has been organizing mango festivals and getting Gujarat Kesar, Baganpalli from Andhra Pradesh, Malgoa from Tamil Nadu….under the Sangam brand. Baganpallis are also available at times at the Andhra Bhavan, New Delhi. The only problem is that they sell a minimum of one box or peti (4 dozens). You can try with other Bhavans if the caterer is kind enough to get you some special from that state.Alphonso mangoes are available at select shops. Rama Stores in Munirka brings in amblis or small green mangoes for pickles (called kanni manga in Tamil) in early Jan / Feb. They also stock some regional varieties during the summer months. The last of the Tongas – Tongas at Sadar Bazaar. Tongas or Horse Drawn Carriages were once the preferred mode of transport in and around Delhi. Old timers would recall taking the Tonga from Old Delhi, from the Railway Stations (Old Delhi, New Delhi & Nizamuddin) to various parts of the city. My father remembers arriving in Delhi (the first time from Pune and it has to become his home ever since!!) in winter on Guru Nanak’s birthday and taking the tonga to Lodhi Road. Even now it brings memories of a wonderful ride, the cold, empty broad roads and a wonderful fast paced horse. The horses, horsemen still exist today removed from the Minto bridge area but active in the Sadar Thana area near Sadar Bazaar (near Bara Tutti). 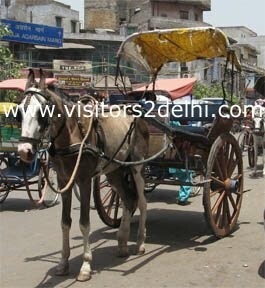 The horses ply from there to the Metro Station, the Sadar Bazaar, Naya Bazaar, Sadar Mandi areas and to Karol Bagh. It might be a curio to residents from other parts of Delhi, but for the locals taking the tonga is a way of life. And no tonga remains empty for long, being filled with passengers soon. Each of the Tongas take 6 – 8 passengers. A stand, a time table and the tongas ply with casual ease. The tonga drivers equally polite courteous and even breaking journey to pick up or drop passengers wherever they want. My recent endeavours to photograph them following the much touted ban (in view of the coming CWG) raised concerned questions as to what would happen to their livelihood? How can the animals be maintained? Will Tongas never be seen on the streets of Delhi again? Who can answer such questions? For me, standing there, the Tongas seem well adept in the “to be made modernistic Delhi”. It is an eco-friendly fun way of travelling, fast and very comfortable. Yes, a wee bit emphasis on maintenance and keeping the area clean, it is a definitive tourist draw!!! Amidst the cars and fast paced life can such an animal drawn transport be viable? Why not, when the Government seems looking for eco-friendly non polluting, non-fuel guzzling bulk mode of transport – why remove one which seems to be functioning pretty well. A further boost, use it as a tourist potential. The areas of Rashtrapati Bhawan, Shanti Van or better still CP, can run on Tonga power, the chaos and parking problem can be taken care off!!! Purists and tech savvy individuals will call me a backward romantic, but kya kahen ki dil hai ki manta nahin!!!!! Nothing beats the food at Chandni Chowk. Eating at Chandni Chowk is a literal cake walk since you cannot go wrong in the choice of place. Even a blind stop and eat will be fruitful with divine taste flowing through the taste buds. Everything is so tasty and every shop has its own story and heritage to tell and has a huge bunch of die hard faithful followers. And the shop can very well operate from under a Peepul / Banyan tree, a crevice window of a building to a eatery with peeling walls. A theory in inverse ratio, the lesser the décor elements of the shop better the food!!!! The art of perfecting your favourite place to pick out the best comes with numerous visits and does one start discerning how to choose, the man selling baked biscuits off the mobile cart, hot and crisp at the end of the Paranthewala Gali comes only for two hours, the man selling hot puris and kachoris at Nai Sarak opens shop only at noon…..and as one starts mastering the eateries, it is with undisguised greedy glee that one plans a visit to the bylanes of Chandni chowk. Believe me, food has never tasted so good before. The true blue blood at Chandni Chowk would of course start with Doodh and jaleebi in the morning even dahi jalebi, followed by the puri aloo (bedmi puri) routine, rounded off with moong dal halwa….well to the uninitiated, every food joint in Chandni Chowk, has its die hard follower, food at every nukkad tastes equally good and is clean and hygienic. Be it the non descript aloo tikki wallah who sells tikki with the khathi chutney right next to the Pepul tree towards the beginning of the Cloth Market or the street side kulfi wallah who dishes out his offering from plastic cones – it used to be earthen pots earlier. 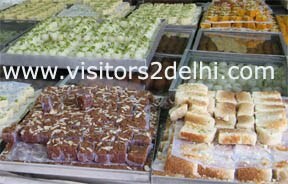 The entire Fatehpuri is lined with some excellent shops for namkeen – namak paras, salted cashews, kachoris, pakoras, chole bhatura, sweets – Karachi halwa, gulab jamun, rasgullahs…. Other joints include the Bikanerwala, Haldiram, to Amritsari Lassi, Juice wallahs, kulfi, channa bhaturawallahs, Chach, Sweetend Dahi, Rabri, halwa makers...almost everywhere. The die hard favourites include kasta Kachoris, Puri subzi menu, yes, the pumkin (sitaphal) finds prime place in the repertoire of vegetables. Chole Bhature, Aloo Tikkis, samosa filled with all kinds of vegetables including gobhi (cauliflowers), namkeens, Lassi, Jalebi, Kulfi…..
Phat phati in Delhi – This was a popular mode to travel short distances especially Connaught Place to Karol Bagh or Connaught Place (New Delhi Railway Station) to Chandni Chowk. The huge Harley bike was suitably refitted to make room for about 7 – 8 passengers. A peculiar contraptions but it was truly a joy to ride it. I miss it and have made innumerable enquiries regarding its operational. The owners have been provided with jeep like vehicles called phat phati but nothing to compare the old. It was called the phat phati because of the noise the model would generate. It typically moved in the garangutan fashion splitting, it was banned to make the air in Delhi less polluted. As it was classified a polluting vehicle. How could just two dozen such vehicle pollute the vast city I still do not understand, a relic with definitive tourist potential if suitably made to run on CNG power??!!!! If someone can tell me if this relic can be sported somewhere, I will gladly write more and of course put up some lovely images. This definitely should be in the heritage or relic category but I had been so fond of it that in my mind it is still contemporary!!! Delhi is a bargain hunter’s paradise for it offers innumerable avenues for buying products sometimes at throwaway prices. Be it the malls, five star shops or usual shopping complexes or even bylanes and shops on pavements, each offering is unique. Sales at malls, shops closing down sometimes offer products at lower than cost prices, this is specially true for interiors, craft, curio shops in the Hauz Khas Village, Shahpurjat, Neb Sarai. Yes, even a casual visit to the areas can bring out gems – the key patience in the hunt and not to loose heart easily!! I have picked up some exquisite stuff in this manner. When bargaining the rule is never show your love for the product, for if the shopkeeper sees even the slightest gleam of love for it in your eyes, he /she will not budge an inch in the negotiations. The trick is to keep the emotions on hold, a very dispassionate appeal and pretend to let the seller convince you to buy it. You know the oft – “I am not too keen on it, I do have plenty which are similar but I do like it and won’t mind another similar piece and well I can afford it” look!!! Boni (pronounced bo as in boat and nee) is the time of the day when business begins usually early morning or when the shop opens. It can vary from as early as 6:00 am to 11:00 am or 12:00 am depending when the shop opens. It is an ideal time for bargain buys, to get the first business of the day, the shopkeeper will at times reduce the prices very sharply. So at times, one can get the product for the price one actually asked. The caveat of course is that, the seller will expect you to pay up and take delivery immediately. And can get annoyed to the extent of shouting expletives if you refuse to buy after bargaining. The boni and its nuances another article does talk of this in great humorous detail. The basic concept though is that, Boni means the first business of the day. A superstition that if the first deal of the day is good, then the business will be good that entire day. Some sellers even have regulars whom they insist on selling the first thing in the morning, assuring that their hand is very good. As the first sale from their hand will result in good sales the rest of the day. Therefore, if shopping in the morning or when the shops open, be careful with your bargaining and don’t go bargaining for products which you may choose not to buy. Else, be prepared to buy what you bargained for. I still remember while trying out Kurtas at DilliHaat, with my cousin, the shop was practically empty and though noon, there had not been any sale. Anyway in the process of our browsing we realized that several more had walked in and we cursed our luck as it meant jostling in the tiny shop. The shopkeeper though termed us lucky for the shop saying, some customers have the ability that the moment they step in more will follow!!! That is the extent of belief when it comes to having good sales!